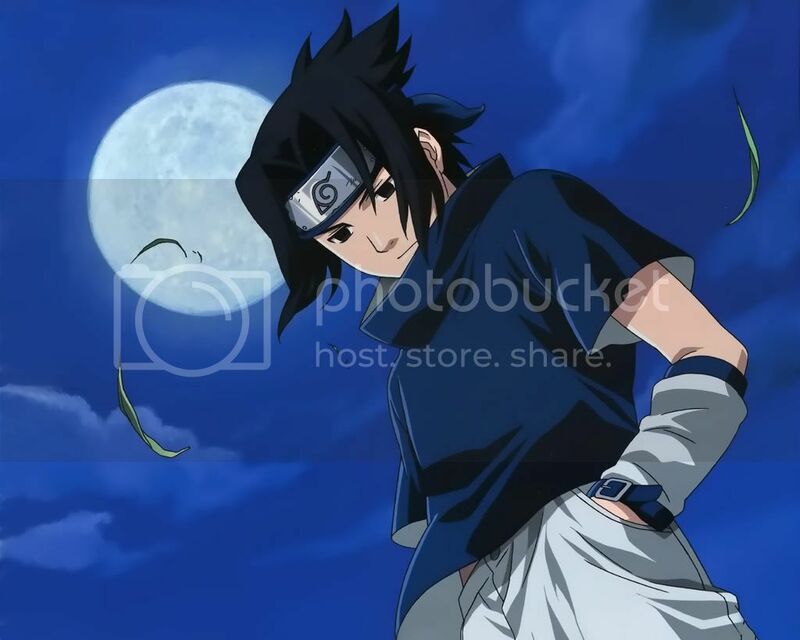 Uchiha Sasuke (Sasuke Uchiha in the English anime) is a character in the manga and anime Naruto. A Genin level Ninja, Sasuke is the natural genius offspring of the once powerful Uchiha Clan. One of the most outstanding clans in Konohagakure, the Uchiha Family was known for its Bloodline Limit ability, the Sharingan, and formed much of the Konohagakure's village police force. Sasuke along with his brother Itachi are the only two known remaining survivors of the clan. The second son of a Konohagakure police captain, Sasuke grew up in the shadow of his older brother, Itachi, who was acknowledged as a prodigy, mastering the Sharingan by the age of 8, attaining Chūnin rank at the age of 10, and becoming an ANBU captain at the age of 13. As a result, the Uchiha clan took great pride and interest in Itachi and viewed him as a genius whose work will further strengthen the bonds between the village and the clan. In particular, Sasuke's father took an active interest in Itachi's career and his entry into ANBU, largely neglecting Sasuke, the younger son, aside from cursory inquiries into Sasuke's school life. While Sasuke looked up to his brother, aspiring to become a prodigy ninja also acknowledged by the clan and his father, Itachi seemed friendly yet distant. Despite his promises to Sasuke to spend quality time, his work seemed to cause him to break his promises. After an incident between Itachi and other Uchiha clan members, relations between Itachi and Sasuke's father deteriorate. Itachi's behavior becomes increasingly bizarre, estranging him further from other members of the Uchiha clan. During this time, Sasuke's father, on a whim, decides to spend time with Sasuke, teaching him Katon: Gōkakyu no Jutsu (Fire Release: Great Fireball Technique). Sasuke eventually succeeds in performing the jutsu in front of his father, surprising him. At that moment, Sasuke finally receives his father's recognition and the right to wear the clan's emblem on his back, a sign of adulthood. He also receives a stern warning not to follow in Itachi's footsteps. One day, on the way home from shuriken practice, Sasuke is horrified to find his entire clan massacred by Itachi, who wanted to test his "capacity". Confronting Itachi in their home, his broken, sobbing self is further subjected to intense psychological torture by Mangekyo Sharingan. Itachi tells him to use his hatred of him to grow stronger: "If you wish to kill me, hate me, detest me, and survive in an unsightly way. Run, run and cling to life. And one day, when you have the same eyes as me, come before me." Driven to match Itachi and later to kill him, Sasuke excelled in every field of study at the Ninja academy, becoming the #1 Academy ninja and the #1 Rookie Genin of that year. Handsome, extremely talented and from a pedigree background, Sasuke is the most popular student in his class, especially among the girls. However, he is admired from afar and he seems not to have had any personal relationships or any close friends in his Academy years, nor was he interested in these relationships to begin with. Even his relationship with Naruto at that stage is merely that of plain dislike, with nothing more than seeds of slight rivalry, intrigue and identification. The two things he is interested as explained in his introduction to his Genin team are the resurrection of his clan and the killing of "a certain man", his brother, Itachi, in a hardly unjustified plight for vengeance. These ambitions under the shadow of his trauma and the endless admiration showered upon him had largely forged his character: arrogant, even-minded, apathetic to human inquiry and fixated on revenge at all costs. It is not until his prolonged exposure to Naruto's comradeship that this disposition changes.